These lightweight .40 Smith & Wesson rounds are a shining example of Speer's innovative approach to ammunition which enhances performance in every aspect. Each cartridge is ignited by a clean-sparking Boxer primer which leaves behind no corrosive salts or mercury. The primer and the reloadable brass casing to which it is attached are both nickel-plated to resist moisture in storage as well as to lower friction; this makes feeding and ejection much more smooth and reliable. The case is filled with a low-flash propellant which helps shooters regain a faster sight picture. 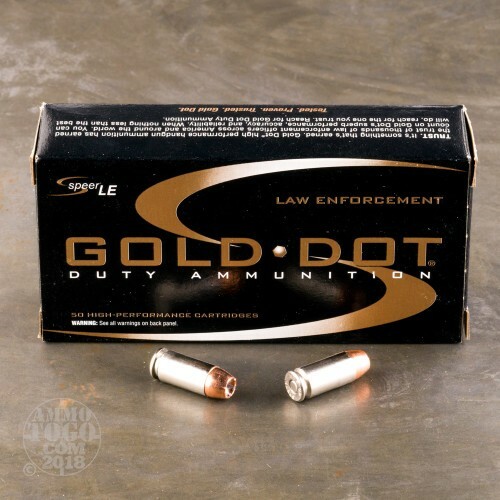 Speer tops off this particular load with a 155-grain Gold Dot hollow point (GDHP) projectile. While the weight is light for the caliber, it is common enough to match many .40 S&W practice loads while boasting relatively manageable recoil along with a flat trajectory of flight. GDHPs possess deep cavities at their noses which are encircled with precise core layering at the edges of their wide mouths. 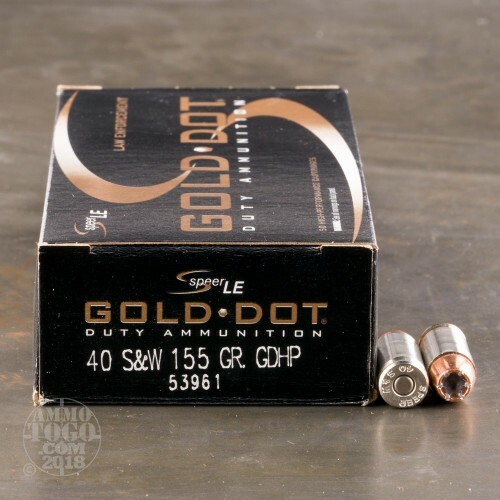 As a result, the bullets expand reliably while entering a threat which helps to create a larger wound tract, decrease the chance of errant over-penetration, and stop the bullet in vital areas for optimum energy transfer that will help drop a threat more quickly. The bonded jacket, which is applied via an electrochemical process, will never separate from the lead core and preserves fight-stopping momentum while helping the bullet defeat light barriers and thick clothing. As you hunt for the best self-defense 40 Smith & Wesson ammo, we thought you might enjoy seeing the results of some testing we recently conducted with calibrated Clear Ballistics gelatin. We shot five of these Speer rounds through a four-layer cloth barrier using a S&W M&P40c. The results are detailed in the video you see above as well as the photographs. 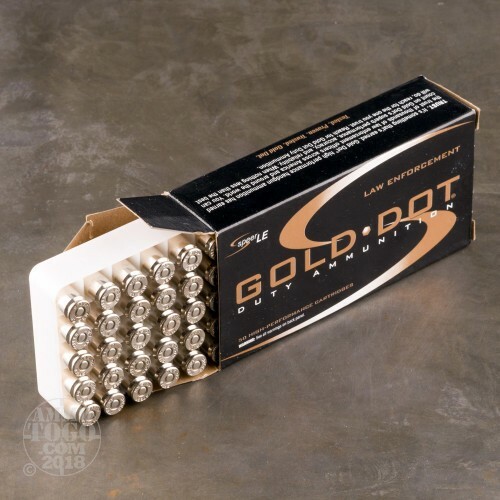 Through the charts, you should get a great idea how this Speer ammo stacked up relative to other 40 Smith & Wesson ammo products available to American shooters. 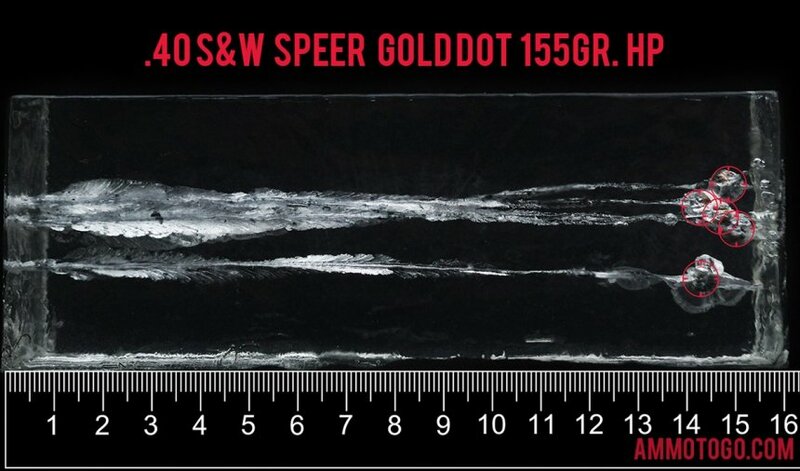 How do the results for this Speer 40 Smith & Wesson compare to other 40 S&W? 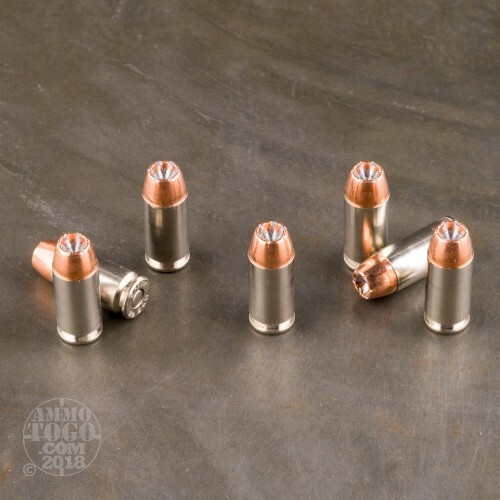 Expansion Diameter Compared to All 40 Smith & Wesson Ammo Tested MIN 0.39" MEDIAN 0.65" THIS AMMO 0.61" U.S. dime MAX 0.89"
Penetration Depth Compared to 40 Smith & Wesson Tested 0" 10" 20" 30" MIN 9.8" MEDIAN 16.5" THIS AMMO 15.1" MAX 32"